Dipl.-Ing. Andreas Kisselbach, born 1962 in Kassel, studied mechanical engineering at the Technical University of Braunschweig. Thereafter, he researched with Prof. Westkämper at the Institute for Machine Tools and Manufacturing Technology (IWF) at the Technical University of Braunschweig in the field of high-performance processing of wood and wood-based materials with a focus on drilling and milling. 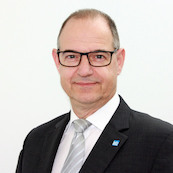 Since 1996 he has been with Leitz GmbH & Co. KG in Oberkochen, where he is responsible for the development of tools and processes for mechanical woodworking, and has directed the "Research and Development" division worldwide for the Leitz Group since 2000. Sawing, milling, drilling in timber construction - that&apos;s what counts!